The ECOXBT by ECOXGEAR is a unique portable audio system combining Bluetooth, Lithium Ion Battery & Waterproof Technologies. 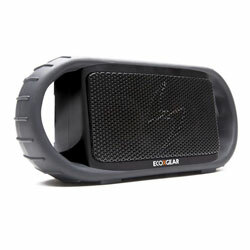 The result is a shock resistant, floating, waterproof, full range rechargeable wireless speaker system. Do everything from stream & play your music from your Bluetooth enabled Smartphone or audio device, to answering your calls over the built-in speaker phone!.